A sudden fall, a triple plight. Trapped is not the same as dead. Nor the led the one to lead. 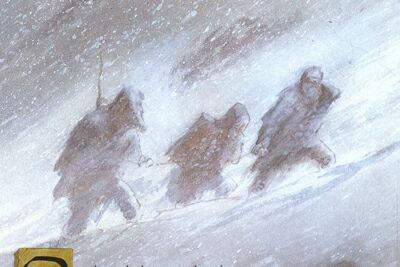 The trio trudge their way through the heavy snowstorm, realizing they will be dead soon if they do not find shelter quickly. Despite knowing this, their progress slows as they reach the mountains. They tie Melek's rope around their waists so as not to lose themselves in the storm. As they walk up a treacherous slope, Melek suddenly loses his footing and slides down the hill, dragging his companions with him. Their fall is stopped by a snowdrift at the bottom of their descent. Orkan recommends that they look for shelter and wait out the storm. He heads around the snowdrift and, to his luck, finds a large crack inside the side of the mountain. The crack leads into a narrow passage inside the mountain. Desperate to escape the storm, Richard and Melek follow Orkan inside. The corridor eventually opens up into a large cave within the mountain, natural stone shelves jutting all over. The three also notice several partially eaten carcasses of animals lying all over. Trying to ignore the rotting meat lying all over, the three decide to consult the Book of Prophecies while they wait out the storm. They debate the meaning of the prophecy, particularly the last three lines, and as they do the storm outside dies down. Eventually they emerge out of the cave with the sun finally in the sky and the mountains covered in fresh snow. As they walk out into the silent mountains, the silence is suddenly broken by a distant howl. Richard asks Melek if he knows the source of the howl. 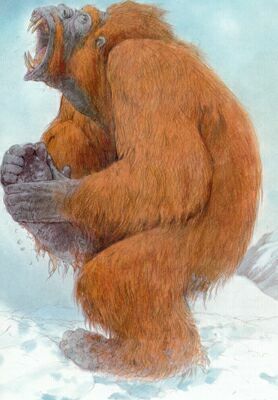 Melek entertains the idea of a snow cat before recalling reading about a creature called Stridor, the supposedly missing link between man and ape who lives in the Snowy Mountains and guards the way to the Forgotten City. Richard realizes that the carcasses they found in the cave were part of Stridor's larder and says they need to get away quickly. Before they could leave, a couple more howls are heard, these ones closer. 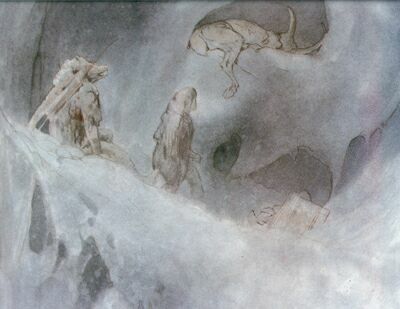 They look down the mountain and see a giant ape-like creature running towards the cave, a dead deer draped across its back. Recognizing the creature as Stridor, Richard and his friends start to run, but the thick snow slows them down. Stridor, on the other hand, moves through the snow easily. Richard led his friends in the hope of gaining some advantage uphill, but the snowstorm had altered the landscape such that he no longer recognizes direction. He pulls out the Path Finder to find the right direction, but before he could use it Stridor catches up and looms over him. Ignoring Richard, Stridor grabs the Path Finder and gazes at his new toy with primal fascination. Richard doesn't hesitate, knowing he cannot lose the Path Finder. He draws his dagger and plunges it into Stridor's foot, causing the beast to drop the instrument and howl in agony. Richard grabs the Path Finder and races back to his friends as Stridor holds his foot in pain. The fierce howls of pain from Stridor ripple throughout the mountain until a delicate shelf of snow on a high precipice crumbles, causing an avalanche of snow. The trio and even Stridor are swept away by the river of snow, carrying them past boulders and trees down the side of the mountain. By the time the avalanche subsides, Richard and his friends are buried beneath layers of frozen white. Richard, trapped under the layers of snow, begins clawing his way furiously upward. He eventually breaks through to the surface, gulping in fresh air as he does. Freed, he looks around and spots a shoe peaking through the snow. He grabs the foot and pulls, yanking Melek from his own tomb of ice. They look around for signs of Orkan, but see none. Just then, a sword bursts through the snow, and Richard and Melek watch as Orkan hacks his way to freedom. At Richard's behest, they rub their hands and faces to restart circulation in their blue skin. A quick check of the Path Finder points down the mountainside to more hospitable hills, and the three waste no time in trekking in that direction. They pray that Stridor, if having survived the avalanche, wouldn't follow them. The journey down the mountain takes them through several valleys and hills, eventually taking them away from the endless snow of the Snowy Mountains. They pass by a broken bridge that once spanned a mountain river, and eventually see what they think are buildings hidden among the hills of the mountain's base. They approach the hidden village, which Melek comments must be the Forgotten City. They walk through the architecturally magnificent city, marveling at how beautiful it looks. 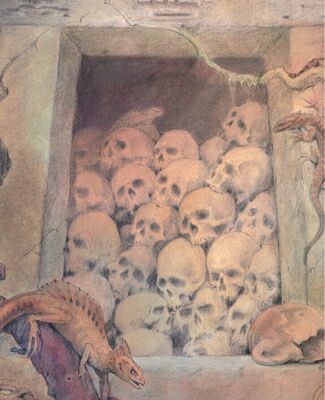 But the lack of people, coupled with large heaps of skulls in some homes, tells them that this city, which has no outer walls, must've fallen to the Evil One. Realizing there is nothing for them in this once-peaceful and welcoming place, Richard checks the Path Finder once more. The Path Finder points towards a peak near the city. Sensing the next pod is nearby, Richard and his companions begin the long climb upward. Several bones litter their way, reminding them of the Evil One yet again. They near the end of their exhausting climb when they suddenly hear a distant howl behind them. They look to see a familiar figure running down the snowy heights they left a long ways back. Stridor had survived, and he was pursuing them. The trio quicken their pace, hoping to get out of Stridor's sight so he would give up on them. 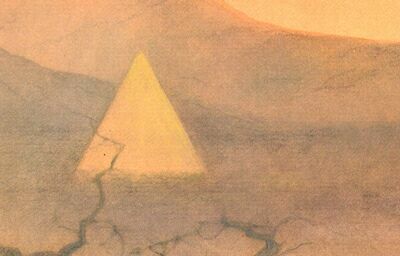 They reach the top of the hill and find themselves overlooking another valley, where a peculiar pyramid structure sits. The Path Finder points directly at the building. After Richard points out that the pyramid is their next destination, Melek bounds past him enthusiastically. Richard suddenly remembers the last line of the prophecy and calls out for Melek to stop, but he is too late. Melek stands on a large rock on the edge of the valley's edge, and without warning the rock tilts forward as if on a hidden mechanism. 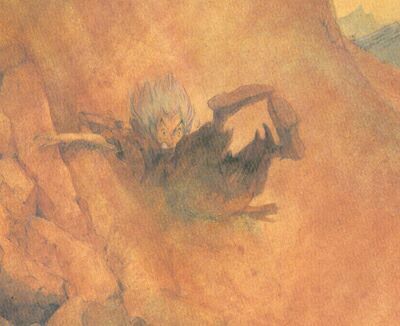 Melek falls down the slide-like slope and tumbles out of sight. 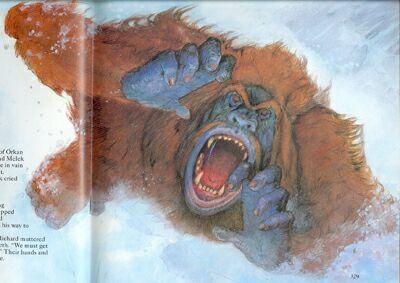 Stridor is a giant ape-like creature that dwells within the Snowy Mountains. Little is known about Stridor except that he is suspected to be the missing link between apes and mankind. Because the Snow Mountains are situated very close to the Forgotten City, it is also assumed that Stridor guards the way over the mountains towards the city, though the reason is never clear. He is a fierce hunter that likes to kill large animals for food. He stores his food in a larder in the mountains. Stridor doesn't seem to have any connection to the Evil One - his existence is his own. "Far below, he could see a thickset, furry creature coming up the hill towards them. It was round-bodied, with long arms and powerful legs, all covered in a furze of straight, brown hair. A large deer was slung across its powerful shoulders. As it approaches, Richard saw that the creature's face was strikingly human, rubbery and wrinkled into dark, clean-edged segments. Now and then the creature stopped and sniffed the air, his gaping nostrils quivering as they pointed in Richard's direction." With the twenty-first issue of The Ancestral Trail, we get a headlining creature that is one of the rarest sort we've seen in the series: a creature that has no close or obvious ties to the Evil One. The last creature not to be directly linked to the Evil One was Hulkan the Mole Monster back in issue fifteen. Having these creatures are helpful reminders that the Ancestral World wasn't a completely safe land before the Evil One conquered it; Melek indicated that Stridor has existed even before the Evil One's arrival, so along with the Klaws and Spectors and Narkums of the world we also get the Stridors and Hulkans and (possibly) Zibellas. Concerning Stridor himself, the ape-like creature proved to be quite a pathetic foe. Instead of killing Richard and his friends for his larder, he went for the Path Finder because it piqued his curiosity. This allowed Richard to strike a blow against him, thus allowing them to evade Stridor after the avalanche. And even when Stridor started chasing them again near the end of the issue, the ape-man is never heard of again once the trio reach the valley with the pyramid. One wonders how the Ancestral World will plan on dealing with Stridor if and when the Evil One is killed. "We've got to get to the mountains as quickly as possible and get some shelter. If we stay in the open, we're dead." Melek: "It could be a large snow cat, or it could be something worse. I once came across a reference to a creature called Stridor who lives in the Snowy Mountains. He's believed to be the missing link between apes and mankind. He guards the way to the Forgotten City." Richard: "Something tells me we've stumbled into his larder. We'd better get away as quickly as we can." "Rub your faces. We must get our circulation going." "Trapped is not the same as dead!"